In the framework of the two right-handed neutrino seesaw model, we consider maximally-restrictive texture-zero patterns for the lepton Yukawa coupling and mass matrices, together with the existence of a remnant CP symmetry. Under this premise, we find that several textures are compatible with the most recent data coming from neutrino oscillation and neutrinoless double beta decay experiments. It is shown that, the maximum number of allowed texture zeros in the Dirac Yukawa coupling matrix is two, for an inverted neutrino mass spectrum. In contrast, for Yukawa coupling matrices with just one texture zero, both normal and inverted orderings of neutrino masses are compatible with data. 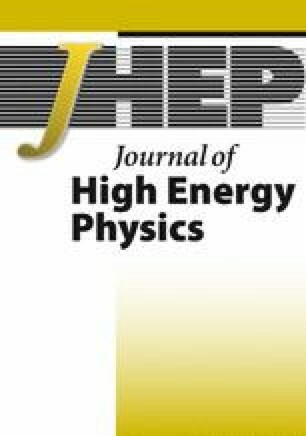 In all cases, the predictions for the low-energy Dirac and Majorana CP-violating phases, and for the effective mass parameter relevant in neutrinoless double-beta decay experiments, are presented and discussed. We also comment on the impact of future experimental improvements in scrutinising texture-zero patterns with a remnant CP symmetry, within the minimal version of the seesaw mechanism considered here. T2K collaboration, Search for CP-violation in Neutrino and Antineutrino Oscillations by the T2K Experiment with 2.2 × 1021 Protons on Target, Phys. Rev. Lett. 121 (2018) 171802 [arXiv:1807.07891] [INSPIRE]. NOvA collaboration, New constraints on oscillation parameters from ν e appearance and ν μ disappearance in the NOvA experiment, Phys. Rev. D 98 (2018) 032012 [arXiv:1806.00096] [INSPIRE]. A. Giuliani, The Mid and Long Term Future of Neutrinoless Double Beta Decay, talk at XXVIII International Conference on Neutrino Physics and Astrophysics, Heidelberg, Germany, 4–9 June 2018 [ https://doi.org/10.5281/zenodo.1286915]. W. Grimus and M.N. Rebelo, Automorphisms in gauge theories and the definition of CP and P, Phys. Rept. 281 (1997) 239 [hep-ph/9506272] [INSPIRE]. J.A. Casas and A. Ibarra, Oscillating neutrinos and μ → e, γ, Nucl. Phys. B 618 (2001) 171 [hep-ph/0103065] [INSPIRE]. W. Grimus, A.S. Joshipura, L. Lavoura and M. Tanimoto, Symmetry realization of texture zeros, Eur. Phys. J. C 36 (2004) 227 [hep-ph/0405016] [INSPIRE]. A. Dighe and N. Sahu, Texture zeroes and discrete flavor symmetries in light and heavy Majorana neutrino mass matrices: a bottom-up approach, arXiv:0812.0695 [INSPIRE]. B. Adhikary, A. Ghosal and P. Roy, mu tau symmetry, tribimaximal mixing and four zero neutrino Yukawa textures, JHEP 10 (2009) 040 [arXiv:0908.2686] [INSPIRE]. N. Nath, μ − τ Reflection Symmetry and Its Explicit Breaking for Leptogenesis in a Minimal Seesaw Model, arXiv:1808.05062 [INSPIRE]. P.H. Frampton, S.L. Glashow and T. Yanagida, Cosmological sign of neutrino CP-violation, Phys. Lett. B 548 (2002) 119 [hep-ph/0208157] [INSPIRE]. A. Ibarra and G.G. Ross, Neutrino phenomenology: The Case of two right-handed neutrinos, Phys. Lett. B 591 (2004) 285 [hep-ph/0312138] [INSPIRE]. CUORE collaboration, First Results from CUORE: A Search for Lepton Number Violation via 0νββ Decay of 130 Te, Phys. Rev. Lett. 120 (2018) 132501 [arXiv:1710.07988] [INSPIRE]. KamLAND-Zen collaboration, Search for double-beta decay of 136 Xe to excited states of 136 Ba with the KamLAND-Zen experiment, Nucl. Phys. A 946 (2016) 171 [arXiv:1509.03724] [INSPIRE].